Purchase Any Above Ground or Inground Radiant Pool & Receive A 5-day All-Inclusive Vacation To A Cancun Resort or Carnival Cruise for FREE! If you were ever interested in purchasing a pool now is the time! –Especially if you like to travel! Now through June 30th, 2017, Continental Pool & Spa has teamed up with Radiant Pools to bring you a deal that is almost too good to be true! 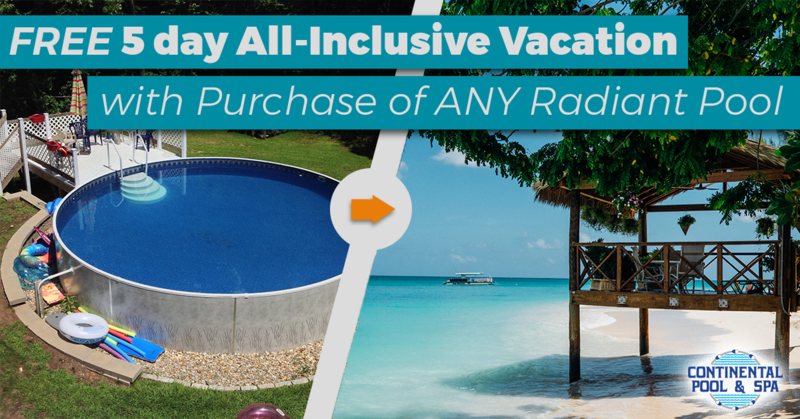 Purchase any above ground or inground Radiant pool and enjoy paradise all summer long in your backyard…and to add to your investment, you will get to enjoy paradise on your FREE get-away vacation of choice! 4 night All Inclusive Cancun Vacation for two adults. Food and domestic drinks are included. Offer is good for the purchase of ANY Radiant Pool including all Metric and Inground pools. Certificate must be registered with TravelAmerica and the vacation must be taken by December 2018. This getaway vacation is worth over $1200! Taxes, booking and port fees are not included. Did you purchase a Radiant Pool during a Getaway Vacation Promotion? Click Here to register for your vacation getaway!